胸部正面图, 显示了肋骨s, 肺 (purple), 横膈膜 (blue), and 心脏 (red outline)的相对位置。心脏瓣膜听诊的最佳位置标有 "M", "T", "A", and "P". 第一心音:发生于房室瓣 - 二尖瓣 (M) and 三尖瓣 (T). 第二心音:发生于半月瓣 -- 主动脉 (A) and 肺动脉 (P). Diagram showing relations of opened heart to front of thoracic wall. Ant. Anterior segment of tricuspid valve. A O. Aorta. A.P. Anterior papillary muscle. In. Innominate artery. L.C.C. 左总颈动脉. L.S. Left subclavian artery. L.V. Left ventricle. P.A. Pulmonary artery. R.A. Right atrium. R.V. Right ventricle. V.S. Ventricular septum. ^ "The Cardiovascular System." Bates, B. A Guide to Physical Examination and History Taking. 9h Ed. 2005. 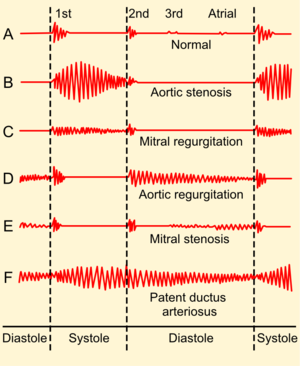 Heart Sounds & Murmurs. University of Dundee.